There�s nothing like the earthy colors of wood and grain to warm a house, or the subtle patterns of nature to warm the soul. That's why our Plant, Flower, & Tree Chopsticks are so popular with Mrs. Lin's Kitchen shoppers who enjoy eating rice with chopsticks. While your table basks in the sunset, your thoughtful little touches, like Maple Leaves In Purple Mist Chopsticks, complete that glow. Black Floral Chopsticks complement a vase of flowers placed at the center of the table, while Pink Daisies Japanese Elegant Chopsticks invite a hint of the tropics to your meal. Imagine Luminescent Floral Chopsticks paired with an exotic meal, Red w/ Butterfly Chopstick paired with leaf-pattern plates, golden chopsticks surrounded by deep greens. 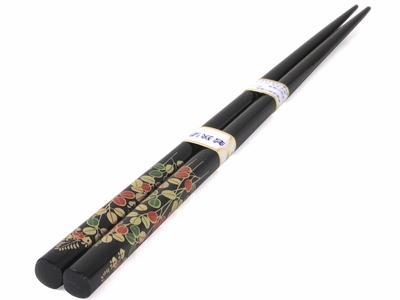 Enjoy a new set of chopsticks today!